please don't use it to see the sun directly , it will be harm to your eyes. If you have any problem about this ,please contact with us. We will help you solve all the problem. [Binoculars 10X42] Compact roof prism 10X42 Binoculars, Durable Framework and Rubber Armor, 10X magnification and 305ft/1000yds Extra Wide field of view, specially designed for any outdoor activities such as climbing, hiking, sightseeing, driving, safaris,astronomy,surveillance,exploring,watching wildlife and scenery. This power also can be used for watching large stage play, vocal concert, a football game, etc. [Quality Optics] 42mm Fully multi-layer coatings green film objective lens and 18mm blue film eyepiece, make your view brighter, clearer and deliver crisp images. Can be used for both day and night (low-light-level night vision,can't see anything in complete darkness). [Lightweight] Item Dimension:5.75in x 4.96in x 2.16in. Weight: 1.23lb, Fit for gifts. 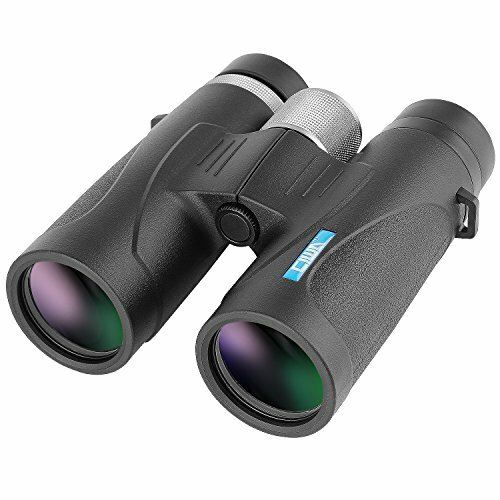 [Binoculars Additional Features] Comes with a smartphone tripod, Compatible with cell phones within 3.15in width. 1/4"-20 threads on the front, You can connect it to a tripod with a binocular adapter.It is very convenient when you watch something for a long time. [Warranty] Limited lifetime warranty and unconditional refund service within 30 days. The accessories that come with the product , such as, smartphone tripods are not covered by this warranty, as well as the accessories sold not together with the product. If you have any questions about this product by Ciwa, contact us by completing and submitting the form below. If you are looking for a specif part number, please include it with your message.